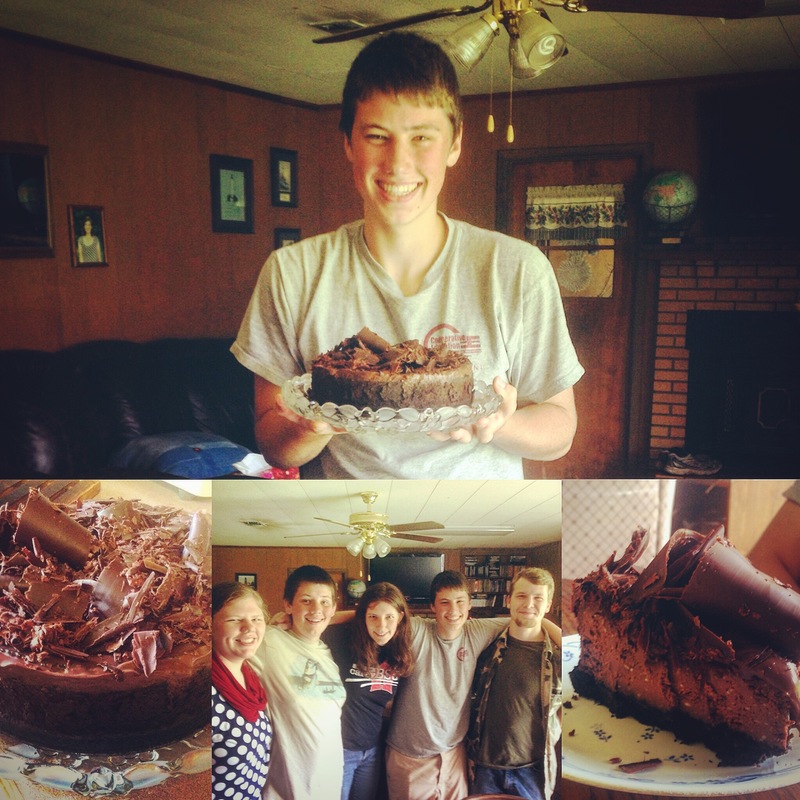 June 18th was my brother, Luke’s, birthday. 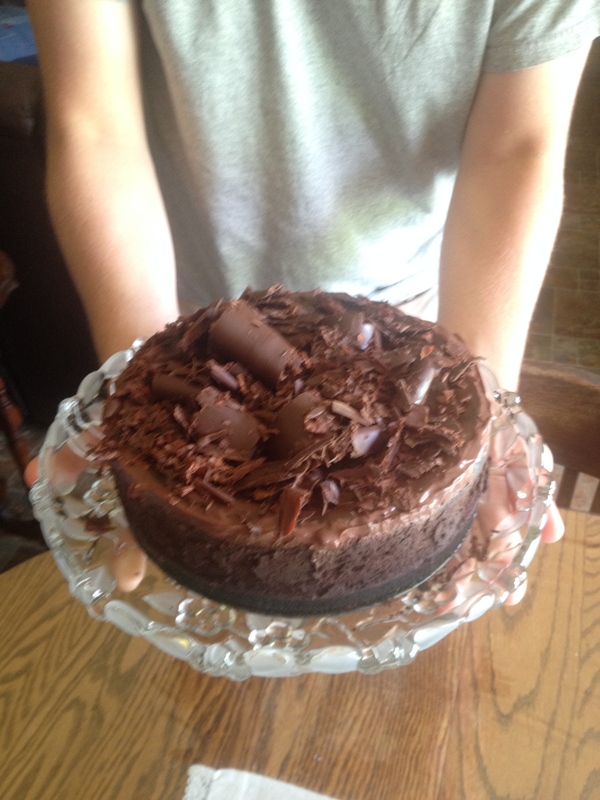 I took advantage of this special occasion to make this recipe for Triple Chocolate Cheese Cake, I ran across on Pintrest a few weeks before. This recipe contains a pack of Oreos, 20 oz. of chocolate, and cocoa powder. Not to mention 2 lb. of cream cheese, plus sugar, eggs, a little butter, and cream. Yeah. It’s loaded. That being said, it was so much fun to make! I mixed up the crust and cake and baked it on a Wednesday night after we got home from church. We were planning to go to swimming at a creek at 7 the next morning, so I had to get it done and chilling so we could have it for lunch when we got home. I mean, that wasn’t all we had for lunch. We also had ‘picnic sandwiches’ inspired by this pin, and this pin. I just used the idea, not the exact recipe. My sister made this bread dough Wednesday night as I mixed up the cheese cake and I baked it Thursday morning and assembled the sandwiches before we left for the creek. I then put the huge round sandwich together, covered it in plastic wrap and placed a cookie sheet and some big books on top, popped it in the refrigerator and we headed to the creek. We had a wonderful, refreshing time wading up and down, gathering cool rocks, tossing un-cool rocks back, swimming in the shade of the bridge, jumping, splashing and tossing each other into the water. Of course, all of this made us very hungry. We devoured the only food we brought with us, leftover blueberry bread from breakfast, on the way home. Thankfully, it didn’t take too long to get lunch on the table. Sadly, I wasn’t fast enough to get a picture of the sandwiches. Suffice it to say, they were delicious. And the cheese cake after was too. 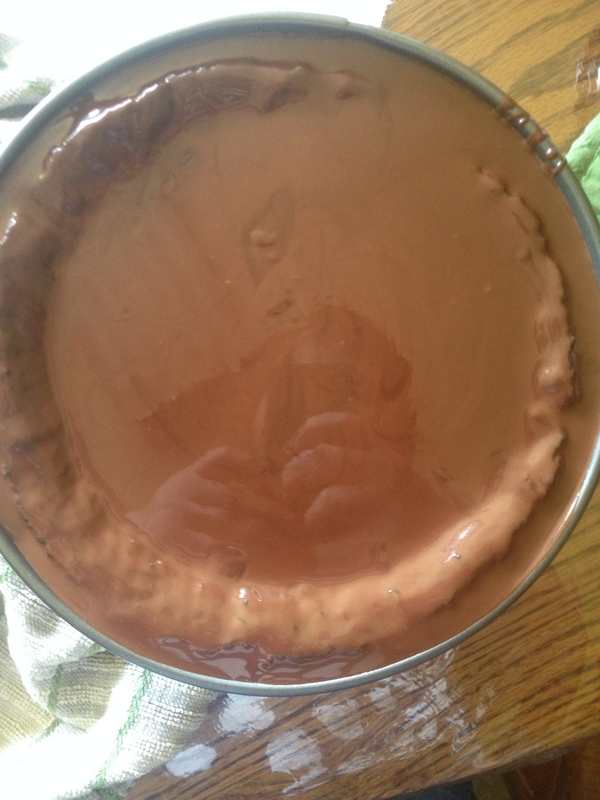 I made the ganache for it after we got back from the creek, and when I poured that mixture of cream, sugar and melted dark chocolate on top of the cheese cake, it look like a mirror made of chocolate! We went from starving to stuffed in 45 minutes. Then we went out and harvested this summer’s potato crop. Maybe not the wisest choice. It’s been busy around here the past few weeks! How was the end of your June?